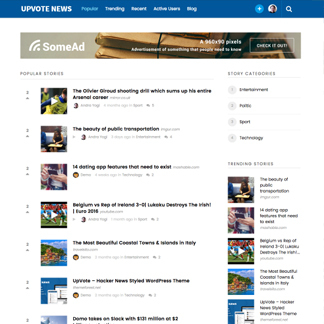 UpVote theme is powered by a custom-build plugin that will enable registered users to submit url (in UpVote we called it story) and the theme can automatically fetch the post title, featured image and description from the link, as long as the url support Open Graph. Users can register to UpVote using WordPress default registration form or simply login using Facebook and Twitter oauth. They can later submit new story (url) or vote on existing stories.